How are you enjoying the 2016 race? Feeling a bit irritated by shameless lies? Underwhelmed by the choices? Anxious about the future? Tired of my asking? If so, you aren't alone. According to the Washington Post, we're all so stressed over this year's election that the American Psychological Association is offering tips to help people cope! As we ramp up for tonight's last debate, I decided to one-up my APA colleagues with a fresh remedy from the cabinets of Worldview Thinking. This election is not really a choice between two candidates. It is an evolutionary process through which we are healing the shadows of wounded masculinity that have long poisoned our culture -- both men and women alike. The process is being orchestrated by nature through a paradoxical quantum logic that connects everyone unconsciously. If you are willing to shift thinking, you can tap nature's orchestrating wisdom to reframe the decision and help usher in a new era of freedom no matter who wins. I elaborate below as we walk through the plan to make this happen. If you're game, please read through once entirely. Then release, shift focus and let these ideas simmer... Watch the debate if you can stomach it. Get a good night's sleep. Tomorrow, if inspiration calls, begin Step 1 as we enter the home stretch together. Every four years, I get happy "thank you" notes from readers who've been using the worldview framework to make sense of election insanity. But this year has been off the hook! As it so happens, four chapters from my 2008 book Igniting Inspiration offeran uncanny expose on the 2016 race. Here's a quick rundown on these four chapters and the electoral insights they help provide. Explains the secret drivers of the disaffected Republican base who voted Trump into power. Helps us understand with compassion why his red-meat antics play so well with certain groups. Explains the inner workings of Donald Trump, demystifying his magical ability to mesmerize his followers with half truths. Helps us see the lonely little boy hiding behind the mask of false bravado. Offers a clear explanation of the inner conflicts that drive the idealistic liberal base to fear and despise Trump with a polarizing venom that undercuts their own values and feeds his power. Delivers insight into the uneasy truce of pragmatism and idealism that Hillary Clinton is attempting in order to transcend Trump's attacks and appear authentic without being open. Your Step 1 mission, should you choose to accept it, is to read these chapters from Igniting Inspiration, focusing on the relationships between these four worldviews. Extra credit: Read Scene 1 and "Plane of Control" glossary item from my new book The Voice Code. Although people from these four worldviews usually see themselves as separate from each other, nature sees them as one unified whole. Collectively they form the Plane of Control, a sort of social operating system for cultures in the developed world. Each worldview serves a critical function that the others cannot. When the Plane of Control is thriving, these contributions merge in a dynamic, synergistic way that lifts every boat. In US politics, Achievers and Believers usually form conservative alliances against liberal Explorer and Pathfinder coalitions. This competitive dynamic is healthy when both parties maintain an honor code. But problems spread like cancer when party leaders institute divisive strategies that choke the healthy flow of information and resources through the system. This causes downward spirals of polarized thinking that lead to gamesmanship, gridlock and massive inefficiencies. But government is always just a microcosm of the whole. Like the four chambers of a human heart, society must maintain a healthy dynamic tension between these four worldview groups to keep life flowing forward. When chronic imbalances arise, problems abound. Crime, poverty, intolerance, greed, corruption and other social ills are but symptoms of clogged arteries on the Plane of Control -- chronic blockages between people and groups in opposing worldview camps. Were relationships between any of these four segments to ever be severed completely, the Plane of Control would have a heart attack and culture would collapse into chaos. Q: What does this have to do with the 2016 presidential race? A: Everything. The "will of the people" grows from chronic unresolved tension on the Plane of Control. In other words, the winner of presidential elections has precious little to do with demographics, campaign funding, or even rational voter decision making...The winner is chosen by nature's intelligence as it speaks through our unconscious as the feeling we call "inspiration." This feeling flows most powerfully towards the candidate best positioned to help restore balance to the Plane of Control. Because of this, the candidate poised to correct the most critical imbalance ALWAYS wins. Always?! Yes. Even if they go down in history as the worst president ever. Nature doesn't play favorites. It doesn't judge success according to polls and pundits. Nature thinks holistically. It seeks to balance opposing forces to maintain the integrity of the playing field through which worldviews evolve. Sure, nature inspires great leaders like Abraham Lincoln. But bone-headed leaders can work just as well. When our cultural arteries get clogged, an epic leadership crisis is often the quickest and most humane way to purge the system of impurities. This is why cruel idiots often rule...They help us clean the skeleton closets of our collective unconscious. We elect them by default when we settle for lifestyles of conformity. Step 2 reveals the next baby step we can take if we'd like to tap nature's genius to avoid this fate. When you've completed Step 1 you will have reframed the election. But "owning the frame" requires certainty. To create this, you must gather first-hand evidence to see that these big ideas are true. Your Step 2 mission is to revisit past politics through this lens. Ask questions. Spot patterns. Look for exceptions. See what sticks. Consider at least three specific past elections. Try to bracket personal biases and see the story through this natural lens. Which worldview segment seemed most alienated before each election? Did the candidate who won connect strongly with this group? Can you find any exceptions this balancing rule? In the current election cycle, which worldview seems most out of balance to you? Between Trump and Clinton, which candidate seems better poised to bring healing to this estranged group? Elections are collective confessions of our yearning to transcend. This yearning is strongest in those who feel most alienated. Their cries ripple across the collective, inspiring some to follow an inner call to make a difference. Even the most cynical politicians are driven, to an extent, by such calls. The more aligned within, the more inspiring they are to those alienated souls whose yearning calls through them. Consider George W. Bush. He didn't even win the 2000 election in practical terms, but the natural resonance between his optimistic Believer (Chapter 9) attitude and the aspirations of the republican base created a tidal wave that swept him into office anyway! Why didn't Al Gore fight the good fight? Because his heart wasn't in it. Why wasn't his heart in it? Nature didn't choose him. He just wasn't the Believers' kinda guy. The problem was many years in the making. After Bill Clinton's "morally relativistic" and financially prosperous tenure, the Achievers, Explorers and Pathfinders were happy campers. But the nearly 25% of our population in the Believer camp were feeling disregarded and desperately in need of a political Voice to speak for them. W's presidency corrected this imbalance and then -- in a classic display of Believer dogmatism -- dramatically overcorrected until the US went down the tubes. Was this a mistake? To many people, yes. To nature? No way. Had this not happened, ancient Believer skeletons would've remained buried, stifling freedom and progress for everyone. Also, without this tragic hubris there wouldn't have been enough unresolved tension the Plane of Control to pave the way for the epic shift that came next. In 2008, an optimistic African American freshman senator with the middle name "Hussein" was swept into office on an epic populist tsunami of "Hope and Change" that brought the Pathfinders into power. This audacious young man followed his inner call to take the world by storm. But he didn't do so alone! The yearning of millions of disempowered Explorers swelled within and lifted him. This "Yes We Can!" yearning grew from the rich soils of a long legacy of Believer blunders by Bush, Jr. How's that for a bipartisan change coalition? Highly efficient, albeit unconscious. After this, Believers splintered off into blustery tribal factions hoping to protecting their homeland from Obama's socialist schemes. Meanwhile, conservative Achievers on the right were herding wild cats trying to keep the old factions together. But when Romney went down, exhausted Believers lost their will to keep fighting. Soon the Plane of Control struck a silent accord to mend the broken Believer-Pathfinder axis. Many (but not all!) Believers started to embrace this new normal, bringing a humbler Believer discipline to our unsettled culture. This accord has only just begun, but it has already accomplished wonders. Seen through nature's musical mind, this gentle revolution is the climax of a brilliant healing symphony that began back in 2000 when Bush first took office. You probably won't hear about it on FOX, but this shift has given healthy Believers newfound freedoms of self-expression, allowing them to embrace activism in areas like climate change and gay rights that were once taboo. It has also paved the way for many secular Explorers and Pathfinders to revisit topics like religion and spirituality in a spirit of innocent wonder. Nature has repeated this elegant, cyclical process endlessly throughout history in many different masks, moving our world from total darkness to the digital age. Here's the big question of today: Who's next? Where will the worldview pendulum pull our Plane of Control on November 8th? They lost trust. Without trust, money and smarts are worthless. Through the great recession, the rise of digital tech, and Obama's two-term year tenure, the "crazy ones" now dominate the Plane of Control on an economic, cultural, and political level. Will the pendulum pull conservative Achievers back into power, or will the progressive Pathfinders keep the wheel? This might seem like a cut and dry question to be determined by ballots, but there's much, much more to the story. To a large extent it all comes down to you, and how you choose to frame your decision. If you do the work of Step 1 and Step 2, you will own this frame with conviction. Then a cool thing will happen naturally: You'll be the change you are seeking. When we observe the Plane of Control without bias, we transcend it. Our consciousness expands to embrace a "both/and" POV that dissolves the sense of separation between inner and outer. We then realize something both trippy and profound... There is no election without us. The election is literally what we make of it. We have total freedom to choose how we see it, and our choice influences events in a very real way. How did Gandhi liberate India without guns or a political office? He understood (and stood for) the true levers of change. Our personal power to affect change grows from within -- through our willingness to love that which we once judged unlovable. Such open-hearted willingness plugs us directly into the creative mind that orchestrates life. When we transcend the Plane of Control within, we naturally bring healing to the Plane of Control without. Cynical spin and power games no longer bother us, because we now see the light hidden beneath them. A lofty vision for us ordinary folks, isn't it? Perhaps. But with the right tools, mastering this mindset is a lot easier than you might think. Along these lines, your Step 3 mission, should you accept it, will be to start practicing being the change by using use the CREATE Script (Scene 6, The Voice Code) to clear any disempowering election shadows that keep you feeling uneasy. Please know: This tool produces miracles. It isn't particularly hard to use, but it does require a little context and a humble commitment to practice. Which is why this grisly election season is such a gem... Amazing practicing material! Enter Trump, stage right. Donald is a doozy, ain't he? He's also the poster child for the wounded Achiever coalition now calling for our help. Trump's promise to "Make America Great Again" may ring hollow with liberals, but it makes violins swell in the hearts of nostalgic Believers and Achievers yearning for redemption. While I dislike Trump's polarizing ways, I cannot help but admire and respect his role in this epic saga. His arguments lack depth and his hair is unsettling, but you've gotta hand it to the guy: he's got balls. He punches with gumption against the tsunami of change now swallowing the old American dream. In so doing, he's giving passionate Voice to the fading coalition that has led our world since the industrial revolution. Will Trump be to Achievers what George W. Bush was to Believers? Will he get into office and blow the world up so that we can start over with kinder gentler Achievers? Meh. Probably not. But if our mission is to be the change, this is beside the point. Consider this: either candidate will be a disaster if we don't heal the Plane of Control, and neither candidate can harm us if we do. The pendulum is pulling for us to bring healing to the worldview that Trump represents. 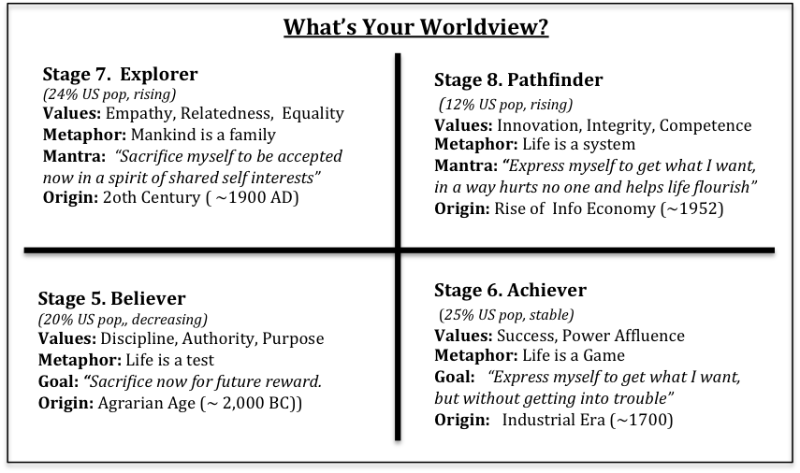 Given the stakes and the fabulous healing opportunity Trump provides, I do hereby request that you place special emphasis on the Achiever in your study of the four worldview segments. For fun, and to help you along, I have taken the original chapter titled "Inspiring the Individualistic Thinker" and rewritten it to focus on this one archetypal Achiever titled "Decoding Donald Trump." I will post this next week on my blog. I hope you'll check it out and enjoy. For me, revisiting this chapter from this perspective was insightful and deeply moving. I felt a lot more caring and compassionate towards Donald and his posse after seeing them through this lens. Seeing those same inner demons in myself, I became aware of my own buried yearning for redemption. Turns out I had been judging him because I didn't want to face the wounded Donald within. Who knew? As with me, so with many others. Let's face it: there is not one person among us, man or woman, who hasn't been affected by the unhealthy Achiever muck that torments this Trump fellow. Hillary too, for that matter. Everyone on the Plane of Control is in this together. I'm 100% confident that we can solve this problem together, if we elect ourselves as the solution. Regardless of who gets the most ballots, we will become powerful force for change. Bonded by a shared purpose that includes everyone, we wield power beyond our comprehension. When we harness this power from the inside out, we can deliberately shift the course of human history forever. However we slice it, nature has spoken. When the pendulum swings, healing must come. Why not make it fun? Why not start now? Why not experiment and see how the story unfolds? This has to be better than cynical resignation, don't you think? Donald Trump is showing us the unspoken elephant on the Plane of Control. May we heed the inner call to forgive the shadows of wounded masculinity within all of us. May we honor Mother Nature's gentle Voice to restore unity to the Plane of Control without needless suffering. May we be the change we are seeking, alone and together, to usher in a new era of shared thriving in the name of true prosperity. The only barrier is belief.